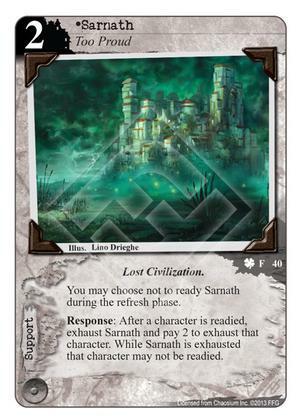 You may choose not to ready Sarnath during the refresh phase. Response: After a character is readied, exhaust Sarnath and pay 2 to exhaust that character. While Sarnath is exhausted that character may not be readied. Is it me or is this card great? Sure, it requires two resources to activate its ability, it locks down even AOs however. Unless of course the cost of 2 + 2 is considered too high for what it does. Chosen for #CardoftheDay for June 25th, 2015. I like the part where Sarnath can target any character. Keeping a 2 resource domain open to use it on -- presumably -- the opponent's turn seems a little high, but I guess the further into the game you get, the better the cost to benefit ratio of keeping a character of your choice locked down. I looked at this for a Syndicate deck that focused on exhausting my opponent for soft control. To help pay for it, since the main time will be during your opponent's turn, what about Arkham Advertiser Archives or The Penthouse? Reinforces combining with Syndicate, but to me it's a great fit. Hmpf. Why does it say 'may not be readied'? I'd be happier if it said 'cannot not be readied'! Is this a bug or a feature? Damon!!! Good catch, Jhaelen. Does that mean another card effect can ready a Sarnathed character? Does that mean another card effect can ready a Sarnathed character? I don't get it. Doesn't "may not be readied" mean the exact same as "can not be readied" ? It's not the same, actually. It prevents the character from readying in the refresh phase, but doesn't stop you from readying them through a card effect (e.g. Forcing the Truth) or if you find a way to commit them they could ready through the arcane struggle. Or on a story with The Silver Key they could be committed and readied. A denial of permission is properly phrased formally by saying may not or with cannot or can’t. You may not use my car tonight. You cannot use my car tonight. You can’t use my car tonight. While Sarnath is exhausted you may not, cannot, can't ready the chosen character. Is that your take on english or from a rules reference somewhere? The point being that 'cannot' is a well defined game term, but 'may not' is rare, so a useful reference would be appreciated, but I wouldn't take an opinion on English to hold nearly as strong. Without a rules reference, all we have is our opinion. Some of the wording in these cards is pretty inconsistent. I remember one that says something like "when this card is refreshed during the refresh phase..." I think they meant "readied" but heck, they could have meant "restored." Or maybe both? But then why wouldn't they have said "readied or restored" instead of "refreshed?" That's the nature of this game.